Just set your management fees and forget it. The system automatically charges your fees to the owner's property account each rental period. 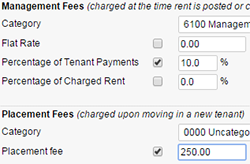 You can choose to set fixed rate fees or charge a percentage of tenant payments or charged rent. Even set minimum and maximum fee amounts. The system also automates placement fees and property reserves.